Overview: XQP Audio offers totally innovative designs in the VPR 500 range format. Amplification, Compression, Distortion, Equalization and De-Essing are available in easy to use, effective and reliable form made with today's top components. 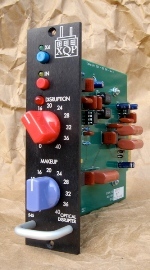 Solid state microphone preamplifier in 500 format. Our opinion: A very quiet mic pre. Present, clean tone due in part to an unusual 600 Ohms input Z. If your tracks tend to sound a bit cloudy and distant, try the 570. Made in the USA. 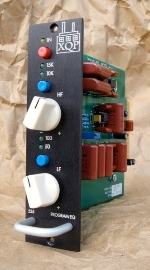 The 570 Mic Preamp is a simple design featuring a Lundahl LL1576 input transformer. Controls include a continuously variable gain pot, 20dB pad, phantom power switch w/ LED, and a 10-step LED peak meter ranging from -12 to +15dB. The 570 has a clear, tight sound with smooth top end. Gain range is from 28 to 65dB, and frequency response is down 3dB at 5.5Hz and 59kHz. Price: 475€ Exc. 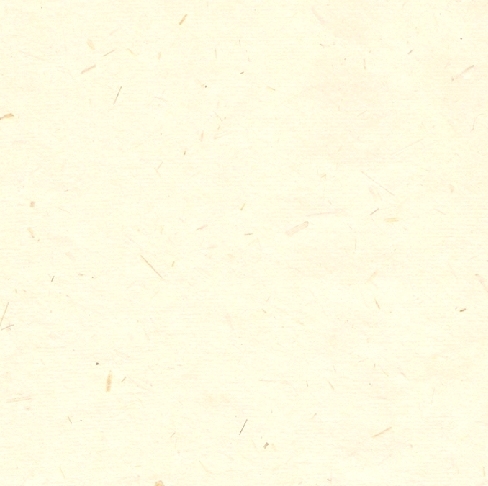 VAT / 574,75€ Inc. VAT. Solid state De-Esser in 500 format. Our opinion: Very smooth and yet simple De-esser. Affordable and Made in the USA. Must have if you do a lot of vocals, voice overs etc. Based on the Dane Optical De-esser #31, the XQP 531 uses a pair of VACTROL® optoisolators to achieve smooth reduction of sibilance. The filter in the sidechain is a high-pass design, switchable to three cutoff frequencies. A HPF, rather than a band-pass, allows any sibilant above the chosen frequency to be reduced. It is our intention to build a smooth, simple, musical device instead of one that is fiddly to operate and difficult to achieve a good sound. Price: 350€ Exc. VAT / 423,50€ Inc. VAT. Solid state dual band equalizer in 500 format. Our opinion: Clean and smooth sounding EQ to "massage" your mix or individual tracks. Works well for mastering when you just need to control the low and top ends. The 535 Program EQ provides basic 2-band equalization with two frequency choices per band. The slopes of the 535 are very gentle shelving type which reach their peaks outside of the generally accepted audible band (20 to 20kHz). A maximum of 4dB/octave is achieved at full boost/cut. Based on the active version of the classic Baxandall circuit, the 535 includes an amplifier for each band to avoid band interaction. Price: 305€ Exc. VAT / 369,05€ Inc. VAT. Solid state mono optical compressor in 500 format. Our opinion: Very easy to use optical compressor, cleaner than the old Urei compressors but with a similar behaviour on isolated tracks. Interesting when stereo linked on mixes. Great on Blues guitar tracks. The 541 Optical Compressor is a feedback style compressor, designed for smooth, unobtrusive gain reduction. Unlike its XQP siblings, the 541 utilizes Silonex optocouplers for gain reduction and subtractive metering. 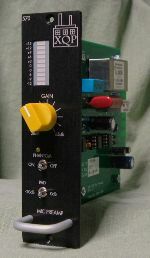 The 541's control set is be minimal, including a ten-segment LED gain reduction meter, a threshold control operating in the dbx-style counter-clockwise direction with a very arbitrary orientation, and makeup gain. There is also a very big yellow lighted IN switch, which we anticipate will cause sales to skyrocket. They haven't yet, but the engines have started at least. Price: 380€ Exc. VAT / 459,80€ Inc. VAT. 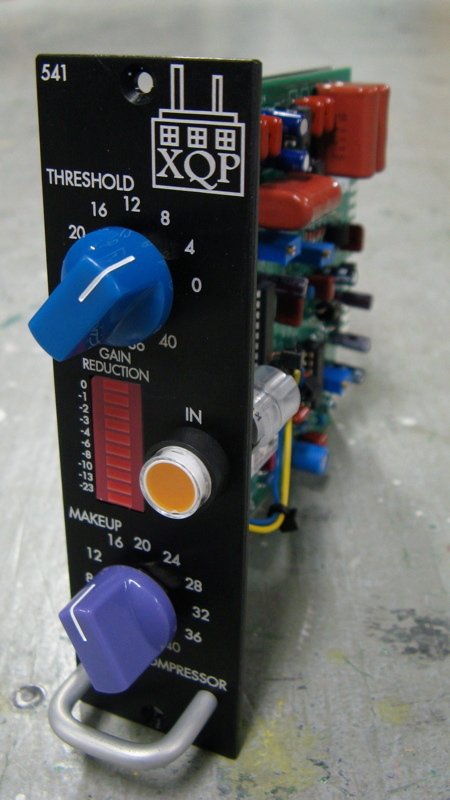 Solid state asymetrical compressor/distortion unit in 500 format. Our opinion: Odd processor adding distortion without clipping. The sound never gets edgey. Very cool unit if you do a lot of keyboard tracks. 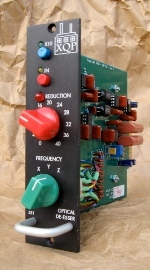 The 545 Optical Disrupter is an optical compressor which creates an asymmetrical waveform as it compresses. It creates second-order harmonic distortion without clipping the signal. The effect is created by compressing only the top half of the waveform. So compression occurs, but distortion is the primary function. Consequently the expense of a gain reduction meter has been omitted. Simply apply the amount of distortion desired and consider compression the natural by-product. 1 X EX-DEMO UNIT LEFT - EMAIL US FOR A QUOTE!